Making the (now) annual pilgrimage to Bancroft for the legendary Rally Tall Pines. In the event that there are delays between stages or I just need a break to warm up, I figure I could post updates and answer questions here. What to expect this year? 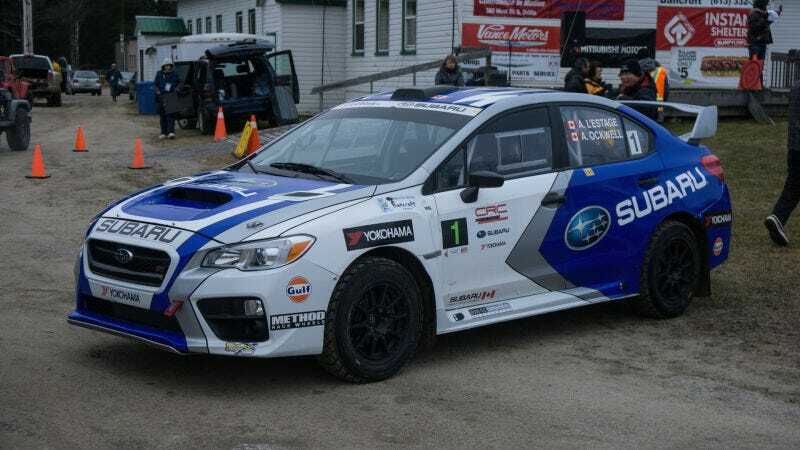 For one, SRT-CAN (Rocket Rally) are returning with their 2015 STI to defend their title. L’Estage/Garrod are currently playing catch-up in the points after a slightly disappointing first half of the season, and head into Rally Tall Pines trailing Labrie by a single point. Djordjevic rounds out the top three with 47 points, meaning that 3 points cover the top 3 drivers with two rounds to go. Additionally, SRT-USA (Vermont Sportscar) and Travis Pastrana are making the trip north of the border to join us and bring with them their 2016 spec STI which finished off the season with another amazing set of results. The weather in Bancroft this year again looks to be warmer than usual, possibly even more so than last year. Temperatures for the weekend are slated to hover at 0 degrees C for the majority of the day with intermittent cloud cover. No precipitation is forecasted although the stage surfaces are likely to be frozen. Rally Tall Pines is one of the most exciting gravel rallies in North America, and provided there aren’t too many mechanical woes this year (looking at you L’Estage), we should be in for an exciting 220km of stages. The latest episode of CRC is also up if you want a championship refresher for the last round in BC. ICYMI here’s some photos from last year! Hoping to produce better photos this time round. And if you want to follow my shenanigans on a more frequent basis, here’s my IG. Wish you were here, Dusty.